Additional Years License – 1 User / 1 Year $350.00. 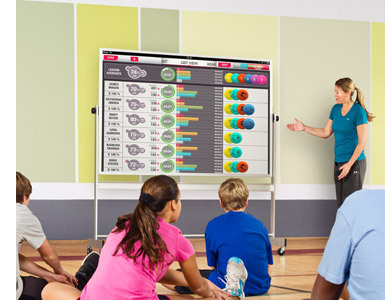 Polar’s newest technology offers educators a unique option for monitoring, grading and communicating with students and parents - and with a level of objectivity not previously available in physical education. Polargofit is designed specifically with teachers, students, Administrators and Parents in mind. As well as allowing the chance to easily document and follow all activity data, it also tracks time spent sleeping. The web service makes it simple to create individual and group reports, tracking long-term progress for each student and class. It’s an easy and secure way to store student data, and sharing information with parents and administrators becomes a straightforward process. Polar offers a variety of solutions for your student and teaching needs. You can choose from either Polar activity monitoring or heart rate monitoring or a combination of both if that better suits your school's program. if you happen to need a fitness assessment system or anything else from the range, you can easily upgrade later. . Using the Polar GoFit Heart Rate app, along with pre-assigned Polar H7 Bluetooth Smart heart rate sensors and an iPad, instructors can motivate and assess students using various metrics including: heart rate, time spent in target heart rate zones, calories burned and virtual badges earned by accomplishing pre-set goals. Data can be projected onto a large screen during class for instant student feedback, and is automatically saved for each lesson during the course. Parents and students can utilize the polargofit.com web tool, which allows them to log on securely to view lessons, track progress and monitor effort throughout the semester. Offers individualized heart rate monitoring using the iPad app and pre-assigned sensors. Provides real-time feedback while also saving the course history for later review. Gives three live training views: target, heart rate and list view. Eliminates subjective grading by providing concrete data regarding effort throughout the course. Serves as a powerful motivation tool for both students and parents. Provides Physical Education professionals the information necessary to show the impact of a strong physical activity program. If you’re looking for web based reporting, individual and teacher logins and the freedom of using an iPad app–Polar GoFit Heart Rate Module is right for you. Polar GoFit app is an easy way to follow your students' heart rates online during a PE lesson. You can define a certain target zone for each lesson and see whether your students achieve the target. During the lesson you can guide them to stay on the correct zone and see the accumulated time on the zone. You can follow this information individually or collectively from the whole class, letting you alter the structure of your lesson in response to instant feedback. At the same time it's an easy and fun way for students to learn about the health benefits on staying in different target heart rate zones. The students can collect badges and even compete against one another, giving a new dimension to their activity. You can see summary data after the lesson and compare all ongoing courses you have. The data is saved automatically to polargofit.com for later analysis and evaluation. All you need is an iPad with the Polar GoFit application, an Internet connection, a user account to polargofit.com web service and wireless Bluetooth Smart heart rate sensors for the students.